Oxford Harmony have been rehearsing at St Ebbe’s School since June 2018 but as from 9th January 2019 we move to Seacourt Hall, OX2 0LW. The move brings better public transport links for new and existing members and more accessible storage for our risers (performance staging). We are looking forward to settling in to our new home. Oxford Harmony will be performing at a concert in Witney on Friday 14th December 2018. We are appearing as guests of the Brize Singers. For details of the evening and how to obtain tickets, please see the event poster. Wednesday 1st March 2017 saw a sad occasion at Oxford Harmony when long standing baritone Mike Thompson, confirmed he would be passing over to the other side within the next few weeks. Fortunately for him, this crossing has been planned for a while and involves the river Severn rather than the Styx. Mike has been singing unexpected notes with Oxford Harmony for the past eight years which, counter-intuitively, is one of the most complimentary things you can say about a baritone. He has been ebulliently cheerful ever since I’ve known him and a great example to those of us who need reminding that life is for living. We will all miss him greatly and our loss is Chepstow’s gain. Good luck Mike and keep singing. The visit to sing for the residents of Beaumont has almost become an annual event; with the chorus being invited back time after time. So it was that a small group of us were given our usual warm greeting (in every sense) by the staff and residents as we performed a half hour set. The unavailability of Anna or Rob to be at the front doing the hand waving meant that John Carter – [JC to us], took over the role. He conducted himself (and us) in an orderly manner and encouraged the residents to join in with some sing along participation. All went well and after our last number – “The Irish Blessing”, a slip of the tongue from JC meant he closed the set with the words “Thank you very much and have a safe journey home”. Immediately realising his mistake he saved the day with “Well that’s us of course”. 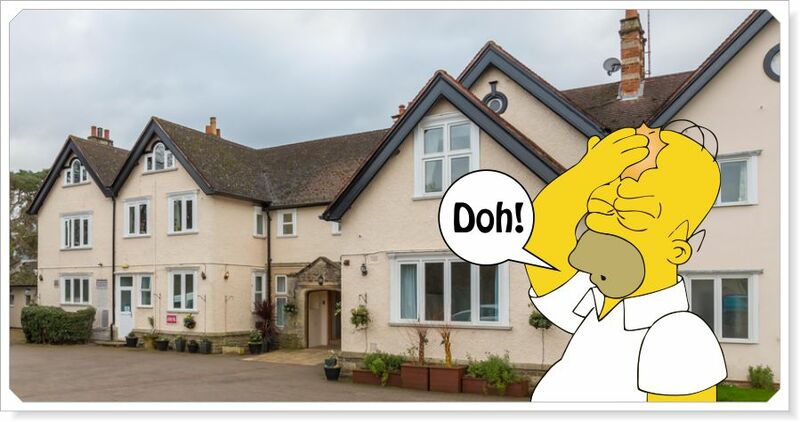 The residents laughed but not as much as the chorus! Great stuff JC. 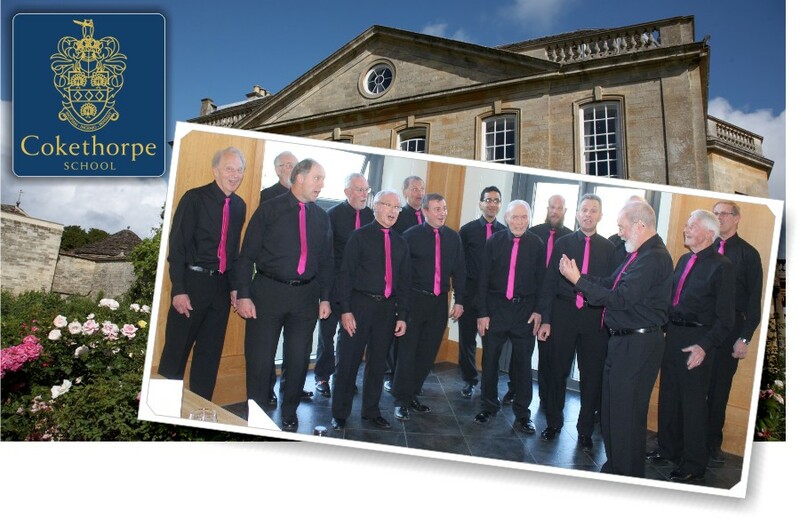 Our annual entry to the festival consisted of the two songs which we are to perform at the British Association of Barbershop Singers (BABS) convention in May – namely “If I Give My Heart To You” and “Zing Went The Strings Of My Heart”. The second number was slightly under rehearsed but it was entered as it was felt that it would be a good opportunity to get feedback from a professional adjudicator about our performance. The open barbershop section of the competition was between two ladies’ choruses and three men’s. With an under strength chorus our performance lacked a little depth but we finished up with an Adjudicator’s Award of Commended. With more work on both songs and taking notice of some excellent perceptive comments by the adjudicator, we should be able to improve on last year’s score when we get to Convention in May. We should also have increased our membership (See below). The first evening of the set of workshops designed to attract more local men to the attraction of close harmony singing saw a small group of people arrive to see what was on offer. John Carter and Anna our Chorus Director put the new men plus the existing chorus through a series of warm up exercises and introduced tags to them. A tag, in barbershop music, is “…a variation put in the last section of the song to give dramatic effect” and can really enhance the ending. The new attendees coped extremely well and appeared to enjoy the session: they all returned the following week so they must have! During the second week a reporter/cameraman from the local community T.V. station, That’s Oxford arrived, interviewed Chairman Clive and then proceeded to film the group during the warming up exercises and tag sessions. The workshops are continuing but we will still manage to sing at the Oxford Music Festival and a sing out in March. Christmas has come and gone with the annual club dinner voted another success by those who attended it. What we must now concentrate on is getting ourselves organised for the “Men – Sing A Cappella” series of workshops that we will be running from the end of January to attract new members to our club. Along the lines of previous Learn to Sing courses, the workshops will provide coaching in breath production, vowel matching, breath control and much more. The coordination of the five Wednesday evening sessions is being managed by Sing out Secretary Mike Eastham. 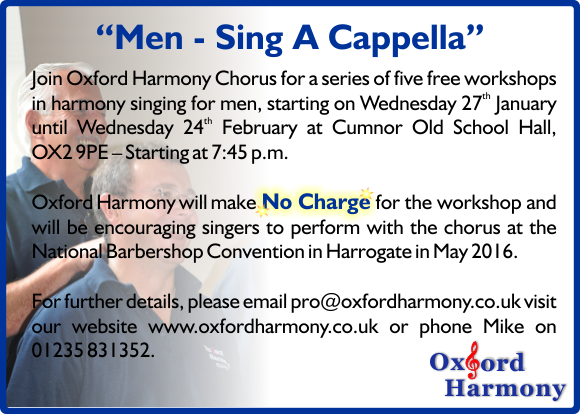 If you’re thinking of joining us for this exciting event then please contact Mike in advance on 01235 831352 or email workshop@oxfordharmony.co.uk. Below is a copy of the advert being placed in a variety of newspapers across the county. “Christmas comes but once a year, and when it comes, it brings ……” more sing out opportunities than you can shake a festive bell tree at. This month we have already performed in Woodstock and Kidlington with another performance due in Oxford. During rehearsals the club have been busy preparing new Christmas numbers plus polishing up some of the more familiar songs the public like to hear. The BABS convention is in May 2016 and so with this in mind the two songs that we will be performing have to be identified soon and rehearsed thoroughly. Who would have thought that such a long lead time would be necessary – but it is! Our club Christmas dinner will be held in the Greyhound pub in Besselsleigh again and if previous evenings are anything to go by it should be fun, well attended and occasioned by song. Watch this space! Let’s see what 2016 has to bring. What a pleasure it was to sing to Irene, her relations and friends at St John the Baptist Hall Church, Kidlington on Saturday. Songs especially chosen from our repertoire seemed to go down really well including those such as the “Hippo Song” which Irene and the audience could readily recognise and join in. The challenge for us was to learn and present “Abide with Me” which was chosen by Irene’s son Martin, because it’s Irene’s favourite hymn. Our chorus director for the day was Richard Wenninger who was deputising for Anna and considering this was his first appearance in the role, he made a good job of it. Everyone had a great time which must have shown, as after the event we received an email from Martin which said “Oxford Harmony were certainly the highlight of Mum’s 90th Party and she was still humming tunes when we visited her this morning. Your polished performance combined with a relaxed and informal air were exactly right for the occasion and will live long in everyone’s memory”. We aim to please! As many of the chorus as were able and who knew Oliver attended a celebration of his life at West Berkshire Crematorium on Wednesday 2nd September. Oliver (Ollie) had been fighting cancer for a while and sadly passed away on 22nd August. The celebration of his life was attended by a packed crematorium of family and friends which included members of Oxford Harmony (OH) and Thames Valley Chorus (TVC). Ollie was a keen musician and barbershopper and a member of both choruses at one stage. He also sang with White Horse Harmony the predecessor of OH. Amongst the very moving tributes by Ollie’s family and some friends, TVC sang “I’m Gonna Live ’til I Die” and OH sang our tribute with “The Irish Blessing”. At the wake immediately afterwards the two choruses got together to sing “Amarillo” to a very appreciative audience. Ollie’s widow Heather enthusiastically joined in as she is a keen choral singer and this was one of Ollie’s favourites. We also gave listeners a couple of Pole Cat (barbershop standard) numbers for good measure. What do you do when a young woman says you are “Tremendous and Gorgeous”? Well in this writer’s case his blushes were unfounded as this was the adjudicator’s verdict when referring to the whole chorus’ (well 10 members) performance at the above event. With good acoustics and a packed audience our two songs, “You Make Me Feel So Young” and “If I Give My Heart To You” went down well. Well enough to receive a 97% verdict from the adjudicator. Unfortunately, Anna our M.D. was not able to make it in time due to traffic problems and so Rob our Deputy M.D. stepped into the breach at the eleventh hour. Also appearing in the Ensemble Chorus Group but not in competition with us were several choruses from Didcot Girls School who were excellent. Unfortunately the wrong gender to try to recruit from! A group of 14 singers performed at the above event with our slot being in St Barnabas’ Church which was adjacent to the street. As it was raining most of the day, we were not unhappy to be singing inside. Despite the rain, the atmosphere in the street was tremendous with plenty of stalls and other events participating in the day. Inside the church were other stalls and we were given a space to sing in. As acoustics go it wasn’t a brilliant position but we gave it our all, ably led by our new Musical Director, Anna. We were well received by onlookers and stall holders alike. “Thank you for joyful, energetic, vibrant singing. You gave me a happy ending to a long day”. The chorus chose the two songs that we have entered in to this year’s BABS convention – namely: “You Make Me Feel So Young” and “If I Give My Heart To You”. The adjudicator was so pleased with our performance that she asked us to sing again on the following evening to close the Festival’s concert. Praise indeed. Wow! What a revelation this singout this turned out to be. Being invited to sing at the Scholars’ Dinner at this very smart and traditional school near Witney, we arrived to provide “background accompaniment entertainment” while the guests were arriving for dinner. They were of all ages; from about 12 years old upwards. The head teacher’s idea was that we would sing whilst the guests mingled and talked with each other. Our opening song was sung to about 80 people standing stock still with glasses of drink in their hands and you could hear a pin drop! John C found it necessary to explain to them what our function was and from then on we sang to a background of raised voices. We enjoyed It and we think they did too, After our set was completed we were invited by the school to join the guests for a three course dinner. Very civilised and hugely enjoyable. The school and staff made us very welcome and I’m sure we would not say no to a request for a return visit. 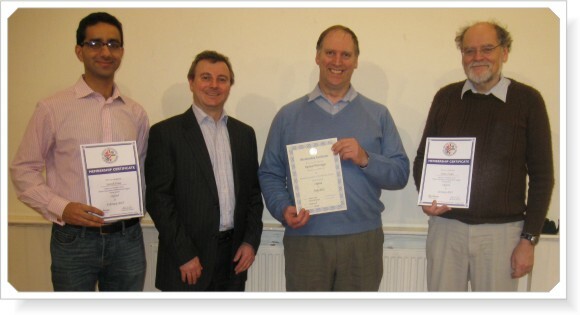 The photo shows three of our members receiving their BABS membership certificates. Sarosh Irani and Steve Fisher joined the chorus after attending our recent Learn To Sing evenings. 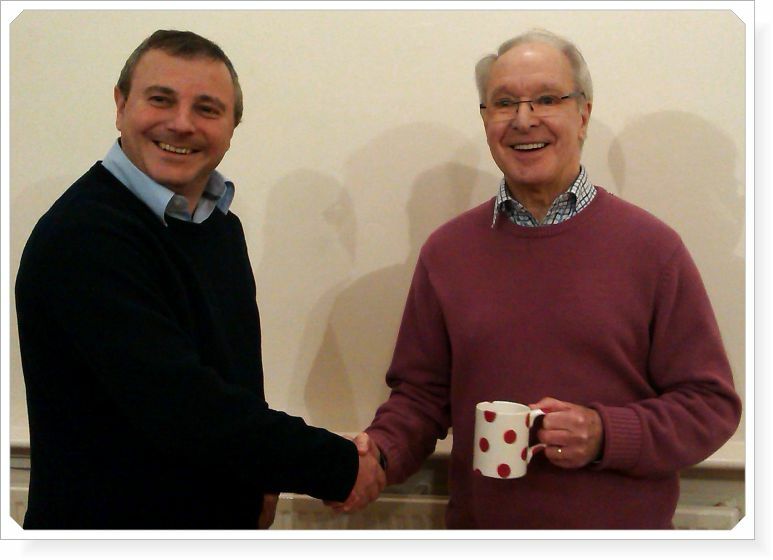 Richard Wenninger has been with us for a while but his certificate has only recently become available. From left to right, Sarosh, Clive Dodimead (club chairman), Richard and Steve. We have recently managed to obtain the services of Anna Shackleton as our musical director designate. Anna is now a member both of our club and BABS (the British Association of Barbershop Singers). 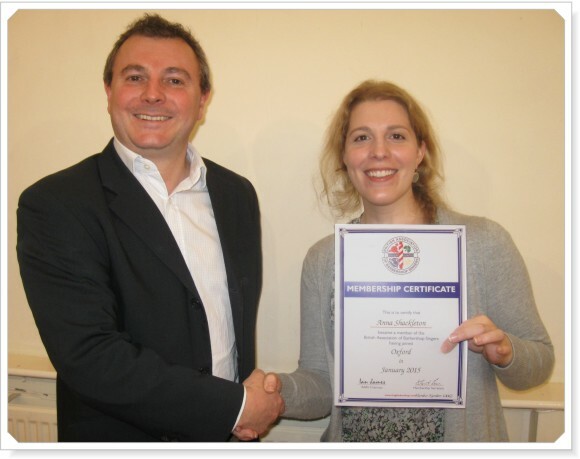 Pictured below is Anna receiving her BABS membership certificate from chairman Clive Dodimead at rehearsal on Wednesday 11th February 2015. Our acting musical director, John Carter, is looking forward to returning to his role of tenor section leader. 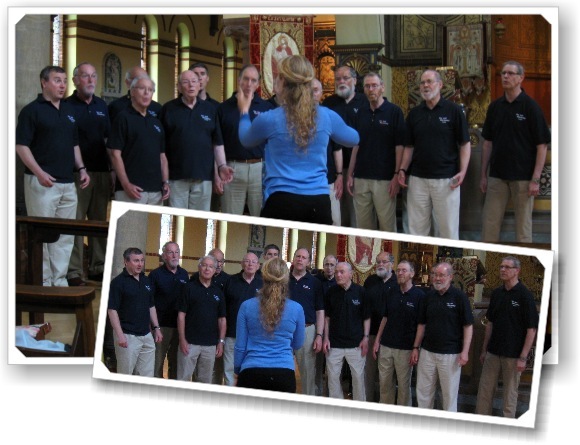 We were entered in two classes this year; Male Voice Choir and Open Barbershop. Due to several withdrawals by other choruses in both categories there were fewer competitors than we had anticipated. This meant that in the Male Choir category we came out on top; Out of one entry! The adjudicator gave us a “Commended” appraisal and some very helpful comments which we will work on. The songs we presented were, “Music To Watch Girls By” and the “The Hippopotamus Song”. For the Open Barbershop category we presented “Shenandoah” and “Is This the Way to Amarillo”. This time we came third against some good opposition from Harmony Inspires and Thames Valley Chorus. Again, but with a different adjudicator we achieved a “Commended” verdict with positive comments to work on. These festivals are useful as a method of obtaining independent appraisals of our ability. What a good evening this was; a full chorus singing to an audience after their monthly social dinner for which they had paid. We were led to believe that they were a very perceptive and possibly critical audience. It was said that it was not unknown that on rare occasions, if they didn’t like the “acts” then they would get up and leave their dinner table. We sang non stop for 45 minutes with the new members joining us for the last twenty minutes. John had put together a really good varied programme that included some audience participation. It all seemed to go down a storm and their organising team and the residents were full of congratulations. One paraphrased the Arnold Schwarzenegger line from the movie Terminator, with –“You’ll be back!”. Let’s hope so as they were good hosts. Christmas came and went and our annual dinner for chorus members and partners at the Greyhound, Besselsleigh was a great success. Musical entertainment by some members added to the evening’s enjoyment; for us anyway and the rest of the pub didn’t seem to be put out by our renditions of Mary Lou, when I’m 64 etc. and Christmas medley. The Oxford Belfry Hotel in Great Milton was the venue for the afternoon’s show and proved to be a really good one with approximately 150 guests to entertain. Given two approximately half hour slots, John was able to put together a really mixed bag of songs. 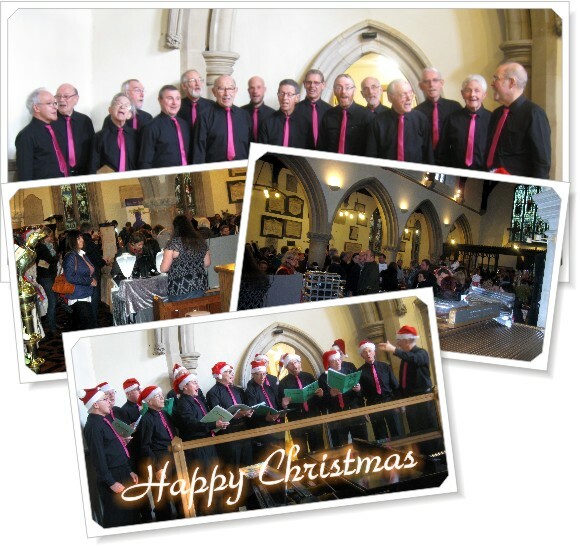 A blend of carols, well known Christmas tunes and some barbershop favourites. Given the wide spread of ages of the audience, there were tunes suitable for everyone and soon feet were tapping throughout the performance by the chorus. We look forward to 2015 and new opportunities for sing outs some of which are on our events page. Another weekend and another sing out. This time to the delightful town of Woodstock to entertain visitors to their Christmas Market. Unlike previous years where we sang in the museum, this time we appeared in St Mary Magdalene church where craft and food stalls were set up. The venue was good as the stalls were arranged between pews and were literally packing them in the aisles. The event was well attended and gave a very warm, comfortable feel to the occasion. We were allocated two 30 minutes slots to sing during the afternoon and 16 Chorus members attended to sing a repertoire that differed from the previous week in that it had more Christmas songs in it; hence the festive hats worn during some numbers. We also wore our more formal attire for a change. John Carter our MD chose different songs for each set which seemed to go down well with those visitors not too distracted by buying Christmas gifts. Our next singout will be 17th December for Thame and District Day Centre Annual Tea Party at “The Oxford Belfry Hotel” – Great Milton. As part of this annual event, all types of choirs across Oxford were invited to perform in various city centre locations throughout the day. 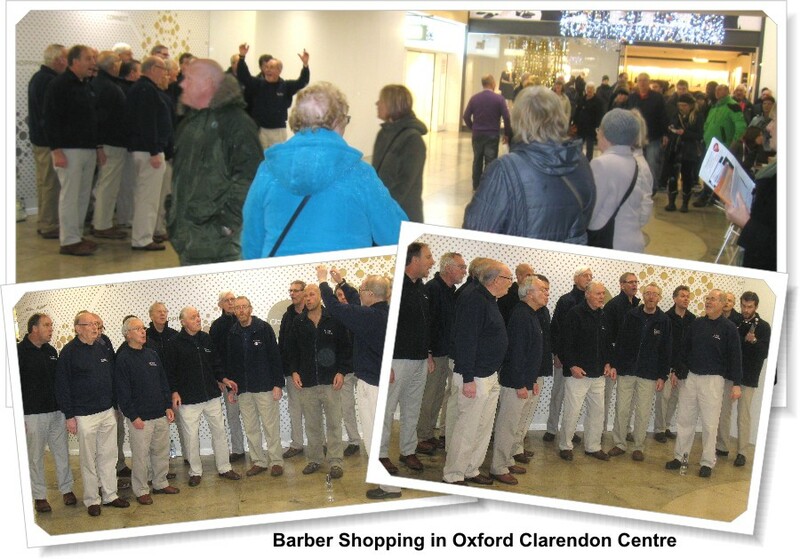 We were among 20 or so choruses and were allocated timed slots in two locations in the city centre; The Clarendon Shopping Centre (outside Costa) and the City of Oxford museum. 16 members performed a varied repertoire in two 15 minute slots (our allocated time) fronted as usual by MD John Carter. The Hippo Song seemed to go down particularly well, with some of the huge (well 30 or so) audience joining in. The feedback from those around seemed very positive. As we expected, the audience at the museum was smaller but that didn’t deter the group as we repeated with gusto the same two sets. The photos show us at the Clarendon Centre but watch this space for more and perhaps a video if the organiser’s representative sends us the footage he took. Next stop Woodstock to perform at their Christmas Market in St Mary Magdalene church.